By Charles Wheelan | January 19, 2018 Once again members of Congress are discussing a compromise immigration bill. The details on the table appear to be similar to the deal that fell apart last week after a bipartisan group of legislators met with President Trump. One might reasonably ask: If a compromise deal fell apart last week, why should we expect better things from Congress and the White House this week? But let me offer a more basic question: Why couldn’t Congress get a comprehensive immigration bill passed last year, or 10 years ago for that matter? The basic issues have not changed since John McCain and Ted Kennedy proposed their comprehensive reform more than a decade ago. A few years after that, Jeb Bush and Thomas “Mac” McLarty (Bill Clinton’s first chief of staff) co-chaired a task force for the Council on Foreign Relations that made a compelling bipartisan case for overhauling U.S. immigration policy. Yes, the clock is now ticking on DACA (Deferred Action for Childhood Arrivals), which has created uncertainty around the future of hundreds of thousands of young people whose parents brought them to the country illegally as children. DACA is the proverbial “burning platform” that might finally motivate Congress to act on immigration more generally. Or not. My prediction is that there will be some narrow DACA fix while broader reforms to the immigration system get kicked down the road—again. That does not need to happen. 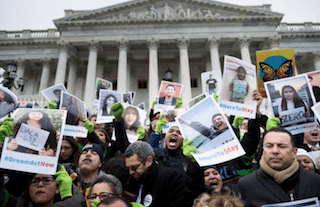 Nearly 90 percent of Americans say they support comprehensive immigration reform. There is plenty of common ground to get something meaningful done. On this issue, like so many others, our political tribes are getting more political mileage out of arguing about immigration than they would by fixing it. Secure the border. Any sovereign nation must exercise this responsibility. If building a wall is the best way to curtail the number of people who enter the country illegally, then we should build a wall. If not, we should spend the money in ways that will curtail illegal immigration more effectively, such as cracking down on employers who hire undocumented workers. Protect the DACA recipients. Most Americans feel that is the right thing to do. Anything else is inhumane and impractical. Create an option for the roughly 11 million people who are in the United States illegally that provides them with some legal status short of citizenship. Deportation is not a realistic option; on the other hand, citizenship should not be an automatic reward for entering the country illegally. Recognize that different kinds of immigrants play different economic roles. High skill workers in Silicon Valley are different than farm workers in Upstate New York who are different from health care workers in urban areas. They all make us better off as a nation. We should design a system that is responsive to our economic needs. Other objectives can be layered on top of that: reuniting families; providing refuge; and so on. Yes, the details are important, but that is always the case. Politicians are elected to find consensus and then write the small print. The tragedy here is not that the country is being torn apart by intractable ideological disagreements on immigration. It’s the opposite: that our two political parties are snatching political divisiveness from the jaws of consensus. Hence the lesson: If we want to fix who gets into the country, we should begin by fixing who gets into Congress. Charles Wheelan is senior lecturer in public policy at Dartmouth College and is Founder and Co-Chair of the Centrist Project, which aims to bridge the partisan divide by electing independent candidates to office.